71.3. The Leeds Pottery also made figures of Newton that, like the one below, are perhaps from the same molds as the Ralph Wood figures. 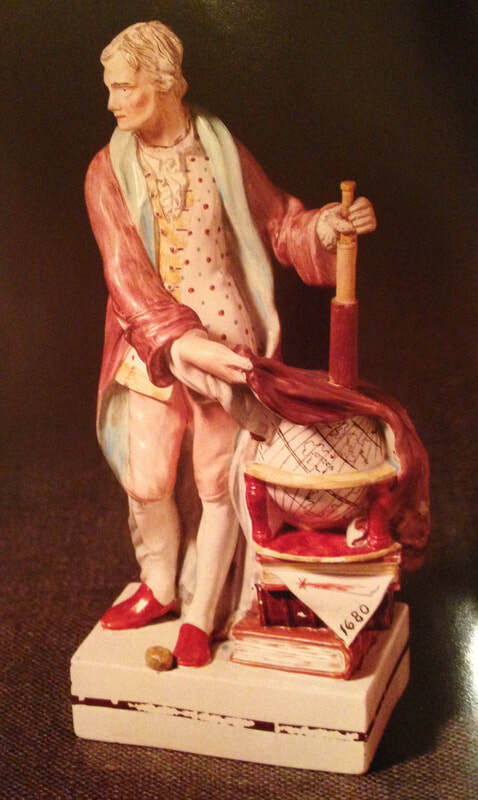 The figure shown is impressed “LEEDS POTTERY” and is at Temple Newsam House. The Leeds figure differs from the Ralph Wood figures shown in Volume 2 in that a small apple is placed on the base, this being an allusion to Newton's discovery of the theory of gravity.Photo from Peter Walton's "Creamware and other English Pottery at Temple Newsam House, Leeds." 71.4-5. The two examples of the figure model below present a bit of a mystery in that the model differs from the Leeds model (the apple is not present) and from the Ralph Wood figure (there are no obvious Ralph Wood attributes). This version was probably made by some other pot bank.